We’re excited to announce that our very first Wind Turbine Trade-In Scheme is now open! This Trade-In Scheme offers you a fantastic opportunity to trade in your old wind turbine in return for £100 off a new one. So, if your old turbine has stopped working or if you simply fancy upgrading to a more modern and efficient turbine for your next sailing adventure, the Trade-In Scheme could be perfect for you. A wide range of new wind turbines are available to buy in the Scheme. This includes the Rutland 1200; the Silentwind 400+ and any AIR (Primus Windpower) or Leading Edge wind turbine. Simply place your order as usual via our easy and secure checkout. Then, we will send out your new wind turbine and you send us your old turbine. We’ll accept the majority of used AIR, Rutland (Marlec), Leading Edge or Silentwind turbines. It doesn’t matter what condition your used turbine is in - we will refund you £100 as soon as we’ve received it. Simple as that. Our Trade-In Scheme applies to both marine and land-based wind generators. 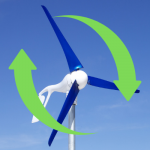 For further information on the Scheme, including the T&Cs, please see: https://www.ecopowershop.com/small-wind-turbine-trade-in-scheme. If you have any questions, please just get in touch. 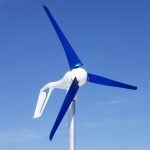 If your old turbine is quite old, you’ll find there has been an impressive amount of innovation in the wind power field from the leading wind turbine manufacturers. The AIR X Marine (from Primus Windpower, USA) has been a long-time favourite with sailors, with a great record for reliability in high wind environments. 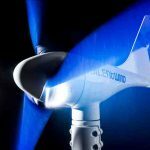 The AIR Silent X is a relatively new product which is the clever combination of the AIR X Marine turbine with the blue Silentwind carbon fibre blades (from Silentwind, Portugal). This offers boat owners the reliability and ease of installation of the long-trusted AIR X Marine turbine, combined with the quiet operation and efficiency of Silentwind’s UV-resistant blades. In line with all Primus Windpower products, the AIR Silent X comes with an industry-leading 5-year long warranty. Marlec’s most recent addition to their brilliant range of wind chargers is the Rutland 1200. A fantastic charge controller, supplied as standard with the Rutland 1200, that uses Maximum Power Point Tracking technology to optimise power generation and Pulse Width Modulation for multi-stage charging to keep the batteries topped up. A unique Tri-namic blade profile which has a very low noise output across all wind speeds; a low cut-in wind speed and excellent power generation. The option to add a remote digital display, allowing you to view the turbine’s performance from a convenient location on your boat. As mentioned above, the blue hand-laminated, UV-resistant carbon fibre blades of the Silentwind 400+ deliver very quiet operation and blade longevity. In addition to this, the Silentwind 400+ now comes with a new style of charge controller that offers Bluetooth connectivity. This gives the user the option to monitor the charging parameters from a tablet or smartphone. 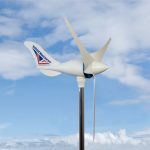 Some of the more modern turbines can also be used with Lithium batteries. This includes the Silentwind 400+ turbine and also the Rutland 1200 on request. Please ask us for further details. Therefore, as you can see there are many good reasons to replace or upgrade your turbine this year. As always, please contact us if you have a technical question about a wind generator.